Rogue One: A Star Wars Story is a film about the Death Star, and the biggest star in it …is dead. Its premise realises the mythic raid to steal the plans of the colossal super-weapon that was the core threat in 1977’s initial instalment. The plans that gave to the rebellion the ‘new hope’ of its now over-emphasised subtitle. That Peter Cushing, laid to rest in 1994, should appear from beyond the grave marks something of a movie milestone being passed. This is not some brief glimpse of his likeness to inject credence. He is a fully formed character, essential to the narrative. It sees digital animation beginning to flirt with becoming indistinguishable from live action. With increasing authenticity, such techniques have blurred the line between the fantastic and the real. Recently, The Jungle Book (2016) saw Neel Sethi the sole real-life actor with the run of Jon Favreau’s digital dreamworld. The inverse of that, this prequel sees Cushing the sole CGI’d human among the truly living. We’ve got used to the efficacy of motion capture to imbue the impossible with realism. With the same method that saw Gollum and King Kong injected with convincing life, the film utilises an actor (Guy Henry) to play the Grand Moff Tarkin role before overlaying the original actor’s features. Permission from the late thespian’s estate has been granted, of course. But, this being the only licence required, what potential burgeons for the ability to reprise much-missed legends of the silver screen? And it does do the job. Throw in a raised eyebrow, his idiosyncratic pronunciation of “military”, and it’s a persuasive enough artifice. Just. That it should be Cushing at the vanguard of this potential descent into the uncanny valley feels like an appropriate tribute. By the time George Lucas’ space opera went into production in the mid seventies, the Hammer stalwart personified a singular brand of genteel terror, crafted over the countless wobbly Brit horrors he was so fond of. His skeletal features, delicate delivery, his exquisite diction… he had become almost a character himself. It made him perfectly suited to play the grand dame of the evil Empire’s madhouse. Both genuinely frightening (the only one with command over Darth Vader remember), and a lovable grandad swishing about the Death Star in his slippers (…as he was to endearingly recall). Lucas was to repeat the Hammer nod by casting Cushing’s nemesis Christopher Lee (as a Count, natch) in his doomed prequels. The film satisfyingly expands on The Force Awakens’ reboot a year ago. 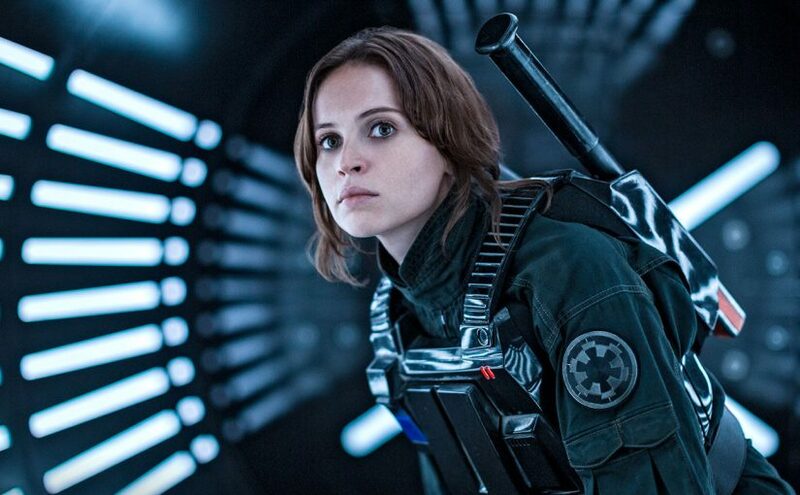 It channels the same freshness, again embodied by a female lead: the compellingly insubordinate Felicity Jones. In tandem, the two ventures represent Disney’s astute handling of cinema’s hard-won golden egg. With BB8 its symbolically distilled mascot, Episode 7 rebirthed the universe for a new generation, hooking in today’s kids with fresh heroes and villains. The folklore of the first trilogy provided the backdrop for their adventures. In parallel, Rogue One is targeted at the original audience, now in their forties, thrilled by a grown-up remix of the much-lauded battered aesthetic. The Imperial Forces have always provided a clear-cut (but U-certificate-friendly) fear in the night. Rogue One makes real the cruel machinations that would fuel such fascism. They are a much more sinister presence than the horror expressed by Kylo Ren’s fevered asylum of devotees. Against expectation, it is only Darth Vader’s re-entry into the atmosphere that disappoints. His silhouetted entrance into this Empire’s house of the long shadows deliberately references that of Cushing and Lee’s most iconic villain, Dracula (1958). And yet it feels oddly anti-climactic. While it can only be James Earl Jones voicing cinema’s most popular baddie, the advancing weakness of the 85-year-old’s speech is uncloakable. But the decision to include the ghoul Vader will delight, especially as the sabre-rattling action steps up towards the end. The end that so neatly provides the beginning. Even if his presence does feel a little cumbersomely tagged on. Director Gareth Edwards has reflected on the double meaning of his title; both as a starship’s designation, but also signifying the first ‘rogue’ feature of the galaxy’s biggest franchise. This is, in essence, the first fan fiction to be given official blessing. Freed from Lucas’s force-grip, it’s produced entirely by those irrevocably touched by his universe. Meanwhile, the studio ensures the main cinematic behemoth continues, in streamlined, 21st century form. Rogue One succeeds in both supplementary and stand-alone fashion. This, together with the ballsy decision to re-animate a collapsed supergiant star of countless hidden horrors, makes it one of the most intriguing and entertaining of recent blockbusters.